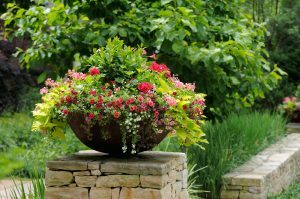 Making your edible planting beds ornamental is a design challenge our design professionals relish here at IVY Studio, a landscape design and installation firm based in Massachusetts. Whether you grow just a few tomatoes or a yard full of vegetables, edibles should be a beautiful part of your overall landscape. When we design vegetable garden areas, we work with color, texture, form and focal points of interest to add an element of visual impact. We try and connect this area to the rest of the landscape and this can be done by creating a beautiful entryway into this space. The inclusion of functional garden art give beans and other climbers a perfect place to grow. A good use of vertical space can also save valuable space and have a sprawling crop like squash grow on a trellis or fence. Adding flowering herbs add an element of color and aroma to the overall space and can also attract pollinators and other beneficial insects. Call us at 781-591-0300 or reach out to us at vern@ivystudioMA.com to learn how we can create an edible addition that seamlessly integrates into your existing landscaping.